There is something quite magical about the sound of African choral singing. 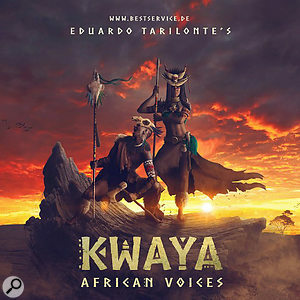 Producer Eduardo Tarilonte, who has an impressive track record when it comes to delivering high-quality niche sample libraries, and Best Service have done their best to capture the essence of that sound in Kwaya. This sample-based virtual instrument designed for Kontakt (the free Player or full version) features the voices of the award winning Uganda-based Aba Taano choir, a group of four male and two female singers. The library is built upon 10,000 individual samples and some 7GB of data. While the library does include some ‘stock’ phrases and a very good crop of vocal rhythm loops (all full of character), Kwaya offers a considerably more satisfying experience than you get with many ‘mmm’ or ‘oohhh’ sample-based choir libraries. At the heart of this is a ‘phrase builder’ that, via the neat Kontakt front-end, allows you to design your own sequence of syllable sounds that can then be triggered from your MIDI keyboard. You get 40 vowel-based syllable choices in total and each is available in a long (six second) and short (staccato style) version. The user can design up to 20 phrases each with up to eight syllable sounds, and can also switch instantly between phrases via a keyswitch system. By using these various vowel sounds, and their sustained and staccato variations, you can coax an amazing array of characterful vocal chants out of the library. The legato mode — which works very smoothly — allows you to flow a specific vowel over several notes in a very natural way. The front end also allows you to mix and pan the six voices and, while the samples are presented ‘dry’, there is a reverb control that taps into Kontakt’s own convolution reverb so the sound can be made as large, or as intimate, as you require. Building phrases is a very easy process and, because we are dealing with vowels rather than preset phrases based upon actual words, there is no danger you might choose a phrase that’s inappropriate for the musical context. That might be something to take more care with when using some of the other content. This includes some fabulous vocal effects patches, shouts, breaths and even some spoken poems, for example, as well as the vocal ‘rhythm’ patches mentioned earlier. These can form quite useful beds to sit underneath parts created using the main choir patch. However, in a rather nice touch, Eduardo has also included a modest selection of atmospheric pad sounds. These are musical in nature; layer the choir on the top and you have a compete cue that just says ‘Africa’ as soon as you hear it. The price suggests Kwaya is aimed at the professional media composer and I expect that audience will absolutely lap it up. It might be a niche sound but Kwaya manages to deliver it with some considerable style.